It would take more than 5 million years to watch the amount of video that will cross global IP networks each month in 2020. Every second, a million minutes of video content will cross the network by 2020. 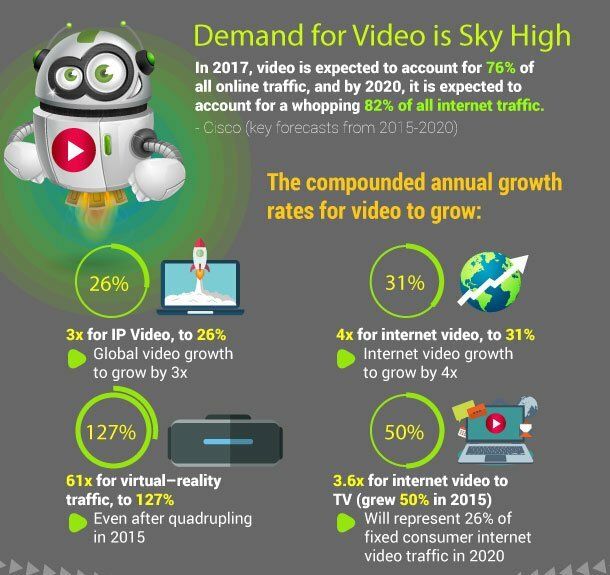 Globally, IP video traffic will be 82 percent of all IP traffic (both business and consumer) by 2020, up from 70 percent in 2015. Global IP video traffic will grow threefold from 2015 to 2020, a CAGR of 26 percent. Internet video traffic will grow fourfold from 2015 to 2020, a CAGR of 31 percent. Virtual reality traffic quadrupled in 2015, from 4.2 petabytes (PB) per month in 2014 to 17.9 PB per month in 2015. Globally, virtual reality traffic will increase 61-fold between 2015 and 2020, a CAGR of 127 percent. Internet video to TV grew 50 percent in 2015. This traffic will continue to grow at a rapid pace, increasing 3.6-fold by 2020. Internet video to TV will be 26 percent of fixed consumer Internet video traffic in 2020. Consumer video-on-demand (VoD) traffic will nearly double by 2020. The amount of VoD traffic in 2020 will be equivalent to 7.2 billion DVDs per month. Internet video surveillance traffic nearly doubled in 2015, from 272 petabytes per month at the end of 2014 to 516 petabytes per month in 2015. Internet video surveillance traffic will increase tenfold between 2015 and 2020. Globally, 3.9 percent of all Internet video traffic will be due to video surveillance in 2020, up from 1.5 percent in 2015.